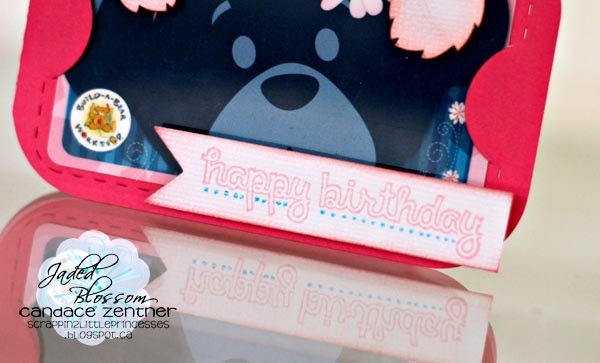 I LOVE the Sweet Birthday Wishes stamp set... The sentiment I choose is one of my fav's from the set because I just love the font. I also used the smaller die in the Flag Dies 2 set. My awesome Bear Shaped Card is from SVG Cutting files. At first I thought I was going to make a brown bear, but I decided to "girl" it up and make a more feminine bear. Isn't she sweet?! Of course she had to have a bow... The Bubblegum Taffy twine from Trendy Twine matched my little bear perfectly. Don't forget that our current challenge is anything Halloween!! Make sure you link up your projects HERE for a chance to win a $10 gift certificate to the Jaded Blossom store!!! that bear is just too cute!